What is Physical Therapy EMR Software? What the most frustrating part of being a healthcare provider: the paperwork and documentation. Transitioning from paper documentation or an outdated software to a great EMR software can improve productivity and the overall care of your patients. No one likes double documentation – if you are entering the data multiple times in your current system, you’re simply wasting time. The best Physical Therapy EMR software will organize your entries in a way that is easily accessible to anyone viewing the chart. Look for support that you can count on. Does the EMR software provider have email and phone support? What are the support hours? How quickly do they respond? How are support tickets submitted? These are all great questions to ask a potential EMR software provider before committing to them. Not all clinics will have a fleet of tablets and laptops, but that shouldn’t stop you from asking if the EMR provider is mobile ready. Having a mobile-ready platform will allow you to test drive technology when you’re ready. It can also be helpful to have a mobile platform if you are away from the clinic and need to access records, so make this a top tier question when looking for the right EMR. A cloud based EMR is different than an in-house EMR built on local servers. Having the ability to access your documentation and clinic statistics anywhere is going to happen much easier with a cloud based EMR. Besides accessibility, storage and security need to be a top priority. Ask these types of questions: what security measures are in place to protect user information? Are there automatic backups, if so, how often are they? What type of protection do you have for the physical servers that your company uses to store our clinic’s data? Also, be sure to ask about the ability to obtain your data if you ever decide to switch EMR providers in the future. The cost to implement an EMR system will vary depending on your clinic’s size, goals, needs, and ability to adapt. The cost of in-house training sessions and unproductive hours to learn the system will need to be considered. Besides these costs, there will be a monthly fee for the new EMR software. The monthly cost for a small clinic may range from $49 to $200+ a month. A larger clinic with multiple therapists will likely spend $200+ a month for a complete EMR. Peter Drucker (the father of management) said “What gets measured gets managed.” If you don’t measure your outcomes with your patients, you won’t be able to track their progress and goals. The same is true with your clinic. The right EMR software will have metrics in place to help you track your clinic goals and productivity standards. Most good EMR software will have a management dashboard that gives you a snapshot of your metrics so that you can focus your energy on the items that need improvement. 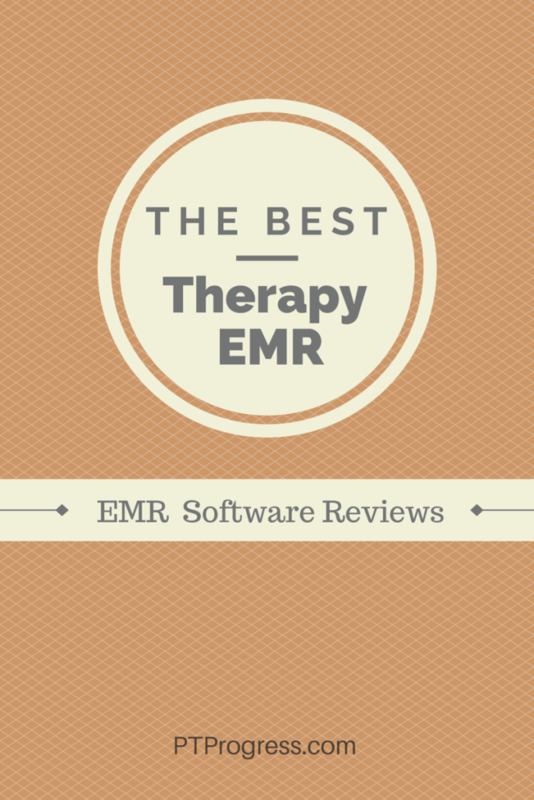 Now that you know what to look for in a therapy billing EMR software, take a look at the detailed Physical Therapy EMR software reviews. Read the reviews and add your own if you have used one of these providers.